James Tam with Brennan Toh and 5 others. action in two drills that required separation of the gripping hand and the rest of the body, irrespective of the horizontal or vertical movements of the opponent’s hand to disengage. In addition, there were push-hands, repetitions of the first-section of Yilu, and a neigong exercise that caught everyone’s attention and interest. We were very happy to welcome participants from out of town, including Kelvin Ho and Hugo Ramiro from Toronto, Gabriel from Quebec City, Nicolas from Montreal and Jean from Petawawa. The second day (13 Nov 2016) of the Ottawa Workshop by Chen Zhonghua Laoshi was held at the Centre de tai chi Gilles-Vaillant, across the Ottawa river in Gatineau, Quebec. This second workshop on Chen Style Taijiquan Practical Method went deeper into the foundations, stretches and critical elements of push-hands that included alignment, engagement, moving surreptitiously into an opponent’s space, how to use the “qua”, switching and rotation. 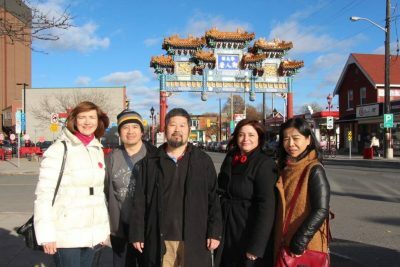 A few photos are included here to provide a taste of the hands-on and personal instructions from Chen Zhonghua Laoshi at the Ottawa Workshop. Many thanks to Master Chen for another outstanding workshop. And, many thanks to Rachelle Bergeron for meticulously organizing the workshop and hosting Master Chen.